It was about a half koku before Urz noticed the mistake. The cavalrymen sent for reconnaissance had reported that they had discovered a different run-down shrine. Furthermore, the squad who went to a nearby village to gather information had also heard a story of a young girl traveler having been sighted. Urz who heard that had the camp removed at once and came running to this place with the soldiers. And as soon as he found the figures of Elizavetta and the demon, he shot an arrow right away to attract the demon’s attention to him. It was really by a hairbreadth. While shouting to the soldiers behind, Urz rode his horse. He took out a new arrow from the quiver hung to his saddle and nocked it. He shortened the distance of both sides to around 200 Alsins before drawing the bowstring. On the other hand, Baba Yaga turned a wondering face to Urz. Urz shot the second arrow. Baba Yaga knocked down that arrow, which was accurately aiming for her head, with one swing of her broom. At the back of the hood worn over her eyes, the demon’s eyes were tinged with a color of doubt. As she muttered, Baba Yaga stepped back as she slid on the ground without changing her posture at all. She lifted her left hand that was half hidden in the hem of her robe and pointed at Elizavetta who was still lying down. Suddenly, Elizavetta’s right arm was pushed straight upwards. None other than the red-haired Vanadis herself stared wide-eyed to the fact that her right arm moved against her will. As she was dragged as such by her right arm, Elizavetta got up. Urz raised a voice of joy and hurried to Elizavetta’s side. To the youth’s eyes, it looked like the Flash Princess of the Thunder Swirl had stood up by herself. Urz was immediately made to understand that it was his misapprehension. Elizavetta turned her back to the demon and shifted Valitsaif which she was holding in her left hand to her right hand. At the same time that she shouted, she swung the black whip while greatly breaking her posture. The whip was not clad in lightning, but it scooped out the atmosphere and was about to drive a strong blow to Urz. Urz, though surprised, promptly inclined his body on horseback. In the brief time he thought that something hot had grazed the area from his cheek to the ear, a dull sound resounded and the horse’s head was blown off. Urz was completely bathed in the fresh blood that was mixed with pieces of meat that had scattered into the atmosphere. The horse’s body greatly inclined and the youth was thrown on the ground. Although he hit his back hard, Urz turned and immediately jumped up. He turned eyes of surprise to Elizavetta without so much as wiping the horse’s blood which dyed his face red. While strongly holding down her right hand grasping the black whip with her left hand, Elizavetta got up. Her red hair was disheveled, her breathing was rough and bitterness overflowed on her expression. Relief in her golden right eye and grief in her blue left eye, both looking at the youth, respectively were shaking. Elizavetta desperately squeezed out her voice. Her right hand brushed off her left hand and once again swung the Thunder Swirl. Urz, although surprised, rolled on the ground and barely dodged the black whip. On the ground where the black whip had hit very hard, a distorted trace similar to a carriage’s wheel was created. It was a destructive power enough to blow away a horse’s neck which was as big as a human’s trunk with one blow. If he had received it directly, Urz would have probably been turned into lumps of flesh in an instant. While taking distance from Elizavetta, Urz looked around. He glared at the old woman with the black robe that was about ten steps away behind Elizavetta. That demon did something to Elizavetta. While fixing his breathing, Urz ran his look to the horse that was lying down at a distant place away. The beheaded horse dyed the ground dark red with blood overflowing from the cut section. About ten arrows that had scattered from the quiver had fallen around. Without taking his eyes off Baba Yaga, Urz carefully approached the horse’s body. In a loud voice, he asked to the old demon woman. Urz and Baba Yaga were about ten Alsins (about ten meter) away from each other. It was a distance difficult to hear for a very ordinary volume of voice. Nevertheless, the old woman’s hoarse voice which was not that loud reached Urz’s ears. Saying up to there, Baba Yaga cut her words for a moment. The demon’s gaze separated from Urz and was turned to Lim, Mashas and the Lebus soldiers who were far away. Although they were ordered to wait on standby and had stopped their advance for the time being, they again rode their horses after witnessing the abnormal situation. Baba Yaga’s magic which controlled the fifteen knights; to perform it, it was necessary for the target person to expose strong feelings. Because the knights at that time got drunk on alcohol and exposed their negative feelings towards Urz, she was able to control them without difficulty. However, the Lebus soldiers heading towards their direction, while thinking that they must help their Vanadis, were perplexed over the strange situation. The magic would probably be incomplete on them. Besides, Baba Yaga wanted to concentrate on Urz and Elizavetta. The old witch swiftly stroked the ground with her broom. A change occurred on the ground between Urz, and Lim and company. As soil mixed with grit rose innumerably, it stretched to the height of about a human adult and began to take the forms of humans. Lim and Mashas who were standing at the vanguard of the soldiers pulled the reins and stopped their horses as they were surprised. The Lebus soldiers also confusedly stopped their horses, and collided with their comrades to the sudden occurrence, many of them fell from their horses. There were no faces on the dolls of clod and their heads were round. They were of a good, tall build, their bodies were smooth, and only by seeing them, they were like statues in the middle of production. But, the parts equivalent to joints such as shoulders, elbows, and knees were moving like those of a human’s. The clod dolls began to move slowly before them; the number about 100. The Lebus soldiers unable to understand immediately what happened, were staring at the dolls of clod with dumbfounded faces. Their reason didn’t catch up to the too much aberrant situation. A certain soldier leaked out a wordless groan, another soldier repeated “what is happening?” as he asked no one in particular. There was also a soldier who recited the names of gods and desperately tried to suppress his agitation. The soldiers’ confusion and panic were also transmitted to Lim and Mashas, who were standing at their vanguard. Time was necessary even for these two people to accept what was happening before their eyes as reality. The distance with the clod dolls shortened. One of the soldiers couldn’t endure the strain and fear and screamed at last. That feeling was also transmitted to the other soldiers; like a ripple spreading on the surface of water. The Lebus soldiers collapsed before the battle and it looked like “every man for himself”. A sharp scolding stuck the soldiers’ earlobes. Having cried out was Lim. Her expression which usually had no fragment of sociability was filled with steepness. It wasn’t as if those clod dolls weren’t frightening for Lim. If she had been the only one in this place, she would’ve probably turned her horse around and run away. However, she held her ground. Her feelings towards Elen and Tigre, and the sense of responsibility which she herself had cultivated held down her fear. Her scolding showed an effect. There was probably also the fact that Lim, who reservedly coped with everything till now, raised her voice. Moreover, while being a person of LeitMeritz and a woman, she was in front of these monsters whose identity was unknown. The self-confidence and guts of the Lebus soldiers who went around battlefields following Elizavetta made them hold their ground. Furthermore, Mashas called out to them in a loud voice. While shaking his gray beard, Mashas showed his usual composure and said. His voice rode upon the winds and also reached the soldiers’ ears in the rear. Even an old aristocrat of a foreign country remained calm. The Lebus soldiers also pulled themselves together. Seeing that their morale was restored, Lim shouted. The commanding officer who heard it gave the order to the soldiers. The Lebus cavalrymen reformed their ranks and set their spears while surrounding the clod dolls at a distance. Lim shouted so for precaution. The characteristic of cavalry was mobility. When needed, they would greatly separate from these strange dolls and make a detour; they could also go to help Tigre and Elizavetta. As she took a breath of relief, she looked at Mashas who was next to her. Mashas answered in a calm voice without taking his eyes off the swarm of dolls. To Lim who was at a loss for words to this unexpected reply, Mashas continued. Mashas leaked a sigh while stroking his gray beard. Lim finally opened her mouth. Mashas remained calm. This old Earl of Brune pulled off something not only Lim, but even Urz or Elizavetta probably wouldn’t have been able to do. Baba Yaga opened wide her eyes and stared at the clods dolls which she created and the Lebus soldiers. Lim’s and Masha’s conversation could also be heard by this demon. Aside from Lim’s scolding-like encouragement, even the old witch was dumbfounded by Masha’s statement. But, the old demon woman, far from losing her temper, struck her broom on the ground while holding back her laughter. Although saying so, Baba Yaga’s eyes were calmly observing the situation. Those clod dolls would be enough for the Lebus soldiers. Even if the 100 cavalrymen had attacked her all at once, Baba Yaga had the confidence that she would drive them away while laughing. Currently, this man and this woman who were in front of her were her priority. The darkish red-haired youth’s black pupils blurring together intense hostility, doubt and some uneasiness glared at Baba Yaga. It looked like Elizavetta had no longer the energy to raise her body, and she was sitting on the ground. Urz threw a question. The old demon woman perfectly understood what the youth was thinking. He obviously wanted to know the true meaning of Baba Yaga’s words. But, Urz’s aim wasn’t only that. While looking for an opening to gather the arrows scattered on the ground, he was also trying to gain time for Elizavetta to recover. At the back of her hood, the old demon woman revealed a sneer. As for Baba Yaga, she wanted to shake Urz. This was because though this human youth was indubitably the “bow”, she could not feel its presence for some reason. This old woman was concerned about it. Without voicing it out, Baba Yaga called out. After a short pause, a reply came with a bored tone of voice. —Can you feel the smell of the “bow” from this human boy? Vodyanoy responded with a tone showing that he did not feel any motivation at all. He was currently lurking underground. When she showed up before Elizavetta, Baba Yaga also had him come just in case. Vodyanoy also consented to come with “if I can meet the bow”. With the result like this, it couldn’t also be helped that he was discouraged. While tapping her shoulder with her broomstick, Baba Yaga looked at Urz. Urz frowned. While watching the youth’s reaction, Baba Yaga continued. A year ago, Elizavetta who lost a duel against Elen came across a run-down shrine when she was taking a walk in Lebus. At that time, Baba Yaga who read the boiling feelings that Elizavetta was holding in her heart called out to her. Though Elizavetta seemed to be puzzled, she answered that she wanted it. Baba Yaga gave the girl the power she desired. Baba Yaga who finished narrating briefly looked at Urz and Elizavetta with a sneer. Urz stood stock still on the spot as he was amazed. Although thinking that he didn’t believe it, his eyes which he turned to Elizavetta weren’t able to remain calm. Elizavetta who was crouched down on the ground holding her right arm raised her face. Their eyes met. She distorted her expression to the extent that she was likely to cry at any time and diverted her eyes. The shame and humiliation of having something known which she didn’t want to be known was overflowing from her face. Urz could not utter his voice. Baba Yaga’s explanation should also have reached her ears. Why didn’t she deny the old witch’s words that were full of malice? Why didn’t she shake her head with a resolute face? As if enjoying Urz’s and Elizavetta’s reactions, the old demon woman said. With only that, Elizavetta got agitated and her shoulders trembled. It was just as the demon expected. But, Elizavetta suddenly raised her face. She desperately shouted, but it reached Urz’s ears with a slightly empty sound. Baba Yaga rounded her back and amusedly laughed. Interrupting Elizavetta’s weak rebuttal, the old demon woman continued while laughing. Elizavetta’s face turned pale. She could not deny Baba Yaga’s words. So could not Urz, too. He must not let this demon talk any more than this. Even though he understood that he must help the master whom he serves, his legs did not move. Baba Yaga lightly wagged her left hand. As if getting hooked by it, Elizavetta stood up. No, she was dragged by her right hand and forcibly made to stand. Elizavetta desperately tried to restrain her right hand. But, she leaked out a short scream and crouched down on the spot. An acute pain ran through her right arm. —Is there nothing I can do to help master? Urz clenched his fist and glared at the small-sized old woman. Why did Baba Yaga explain so carefully? This old witch knew for sure that talking about a detailed fact was the most effective way to give shock and despair to Urz and Elizavetta. Much to their chagrin, that way of doing things succeeded above all else. Elizavetta hung her head down and her shoulders were shaking. Without being able to return even a word to the demon’s sneer. The youth could not deny that feeling of Elizavetta. This was because Urz had also wanted power when they had confronted the Double Headed Dragon. —But, the power given by this hag isn’t good. Only that, I can’t accept. Urz wanted to shout so. Elizavetta should also understand that. As he muttered that, Urz desperately worked out his thoughts. I don’t want to lose. I don’t want to lose to anyone. She said that; this was what Elizavetta wished for. And so, Baba Yaga heard her wish and gave her power. How could he make her deny that power? Groundless words and methods weren’t good. Besides, Baba Yaga would probably counter them with plausible words. The frightening aspect of old demon woman was the fact that she could play with one’s feelings. Compared to that, employing a dragon or using strange magic was nothing. Urz desperately thought about words to persuade Elizavetta. There is no human who has never lost. Or, there are many things you can get from defeat. Saying such things was not good. Elizavetta should understand things to that extent. Persuading her, that including Naum and Lazarl there were many people supporting her. That also was not good. According to Baba Yaga’s words, it was one year ago that Elizavetta wanted that power. She was already Vanadis; Naum and Lazarl also obeyed her. In that situation still, Elizavetta sought power. It wasn’t something which could deny her strong feeling of not wanting to lose. Urz looked at the bow held in his left hand. Power in order to not lose; in that case, he should just deny it (power given by Baba Yaga) with a greater power. If it was that black bow which blew off the Double Headed Dragon’s head, then he should be able to do that much. —No! What am I thinking? Urz violently shook his head and drove away that thought. If he could draw out that black bow, it might certainly be able to surpass Baba Yaga’s power. However, that was a brutal power which could hurt Elizavetta. One wrong move and he might take her life. The tight situation without room irritated Urz. There was no time to think about what’s right. Even if little information was connected (connecting the dots between Baba Yaga’s story and Elizavetta), even if he did not have conviction, he had to act. Elizavetta said. While being dragged by her right hand, she continued intermittently with a weak voice. Urz’s chest ached at her words. While Elizavetta tried to let Urz escape, even so she did not try to deny Baba Yaga’s power. The youth remembered about Elizavetta’s past life which he heard about from Naum. It was understandable that she craved for power and clung to it. Even so, he had to tear her off from that power. Suddenly, something flashed through Urz’s mind. It was a dangerous bet. But, Urz thought that if it went well, it could strongly persuade Elizavetta more than a half-hearted persuasion and even the black bow’s power. Urz stared straight at Elizavetta and opened his mouth. Elizavetta stared at Urz with a dumbfounded face. The youth’s words surprised the red-haired Vanadis that much. What on earth was he thinking in this situation? Didn’t he blurt out something unexpected as he was unable to endure reality? Of course, Urz was calm. He calmly nodded and explained. Urz looked at Baba Yaga with a composed attitude so as not to let her discern his strain and impatience. Urz grasped the bow with an impudent smile using more power than necessary. Conflict was repeated in his heart about whether it was really all right with this method? But, he could not afford to think any further. And, there were only Urz and Elizavetta here now. Lim, Mashas, and the Lebus soldiers have their action obstructed by the dolls created by the old witch. Urz had to do it. After all, there was only this opportunity now. Though Baba Yaga did not answer, she showed no signs of moving. It looked like she intended to watch this bet. Urz inwardly raised a voice of joy as he broke through the greatest obstacle. He was most afraid of Baba Yaga’s intervention. If this demon had laughed at Urz’s proposal and given orders to Elizavetta’s right hand, he wouldn’t have been able to avoid the worst outcome. When Urz picked up one arrow which had fell on the ground, he carefully wiped the sickle and the feathers with the hem of his clothes. It was an arrow which he could by no means miss. He should pile up caution on top on caution. He set up his bow and nocked the arrow. He pulled the bowstring only to halfway. —You were way too cautious of me. The old demon woman knew that the youth had a power beyond human understanding. And she found it strange that he did not use it. Therefore, she probably allowed only him to approach while making Lim, Mashas, and the Lebus soldiers face the clod dolls. He thought that if he said something unexpected, she would watch the situation at least once without interfering, and it was as he planned. Urz shook his head as he thought about it. It was meaningless even if he thought about it. He just had to believe in himself and shoot the arrow. Urz and Elizavetta were opposite to each other. The red-haired Vanadis loosely lowered both her arms, closed her eyes and stood stock still on the spot. Her figure looked like either she believed in Urz or she gave up on everything. He must make her understand; that she did not need that power. Wind blew. Urz held his breathe and focused his consciousness on his fingertips. The air which grew tense wrapped the place. The wind stopped. The youth’s fingers separated from the bowstring and the arrow. Rather than tearing the wind, the arrow flew riding on it. The target was Elizavetta’s right arm. A sigh of disappointment leaked from the old demon’s mouth. Elizavetta’s right hand raised the Thunder Swirl and was about to smash the arrow approaching her. No matter how accurate the aim was, it was just an arrow. It looked like it could be smashed to pieces by one swing of the black whip. Valitsaif unnaturally changed its trajectory in the air, drew an arc and twined around Elizavetta’s right hand. The red-haired Vadnais’s eyes widened to this. From the handle to the tip the Thunder Swirl was tinged with white light and it released a feeble thunder stroke to its master’s right hand. A groan of short pain leaked from Elizavetta’s mouth. And, the arrow shot by the youth pierced Elizavetta’s upper arm. Fresh blood scattered and the red-haired Vanadis staggered. Sweat suddenly gushed out from the face of Urz who confirmed it. After a short pause, the youth took down the bow and greatly exhaled. His fingertips faintly trembled. His feeling of relief was much greater than his joy. While fixing his breathing, Urz gazed at Baba Yaga. Even if she wielded the power given to her, the Viralt would force Elizavetta to defeat. If Elizavetta still persisted in clinging to Baba Yaga’s power, she would have to choose. Either continuing to be a Vanadis or abandoned being a Vanadis. Urz had a firm belief that there was no way that she would abandon being a Vanadis. And as long as Elizavetta was a Vanadis, her Viralt would not leave her side. Even for Valitsaif, if it was grasped in Elizavetta’s hand and was wielded by her will, it might have stayed quiet. Precisely because it felt the will of someone other than Elizavetta in her right arm, the Viralt moved on its own. Elizavetta understood it, too. Applying her left hand to her right arm which the black whip had twined around, Elizavetta sat on the spot. From her eyes of different colors, large drops of tears overflowed. Her Viralt does not utter words. But, so as to comfort her, the Thunder Swirl was tinged with white light. Perhaps, Valitsaif was waiting for this moment. Elizavetta would definitely have no choice but to use the power given by Baba Yaga when necessary. In other words, it would be when she would fall into a dangerous situation if she didn’t use that power. That’s why the Thunder Swirl wasn’t able to stop Elizavetta. After all, she might have lost her life. Elizavetta pulled out the arrow which pierced her right arm. Fresh blood scattered and wetted the ground. Tears had wetted the ground at her feet. To the point of having clung to a fake power. Tightly grasping the Thunder Swirl in her right hand, Elizavetta stood up. Her pupils devoid of all hesitation stared at Baba Yaga. As if responding to her voice, white lightning surged from the tip of the handle of the black whip. On the other hand, Baba Yaga snorted in displeasure. Of course, the fact that her interference to Elizavetta became weak as she rejected her wish was not funny. But more than that, she didn’t like the fact that Urz did not reveal the power of the black bow. The old witch’s purpose was Urz, and Elizavetta was only a playmate. An ominous bloodlust was released from the demon’s whole body. Urz and Elizavetta unintentionally stepped back. The old witch’s eyes peeped out from the back of the hood and emitted a white light. The hand grasping the broom was dyed black, and her small-sized body rapidly swelled up and pressed against her black robe. A sharp horn stuck out from her forehead and tore up her hood from the inside. Her hooked nose increased its sharpness, her mouth tore up to her ears and white fangs peeped out from it. The whiteness of the fangs strangely stood out as her skin was black. Her eyes were hung up to a frightening extent and her ears also became long and slender and sharp on the edges. It was no longer a human’s face. Her robe was torn off. The small-sized old woman who should have been much smaller than Elizavetta owned a body like a human adult now. Making a dry sound, the broom grasped in the demon’s hand disappeared. The skin was jet black and her body was so thin, enough to make one think it was made only of skin and bones. And on her back, there were huge wings very similar to those of a bat. As Baba Yaga stuck out her chest and looked up at the sky, she greatly opened her mouth and breathed out black fog-like miasma. As if expressing the joy of throwing off her tight clothes. —Is this that old woman’s true form…? Urz opened his eyes wide and stood petrified in utter amazement. The shock due to the demon’s transformation was great and he didn’t know what the best thing to do was. A fireball was produced above Baba Yaga’s head and fired towards Urz. However, the mass of hell fire that attacked and was clad in flickering flames was blown off by something just before hitting the youth. A roaring sound shook the atmosphere and a blast and sparks tinged with heat burnt Urz’s skin and rouse him. Having scolded him was Elizavetta. The Flash Princess of the Thunder Swirl grasping the black whip with her left hand and burning intense fighting spirit in her eyes of different colors glared at the demon. Elizavetta laughed at Baba Yaga’s provocation. Reflecting Elizavetta’s anger, the black whip’s tip shone tinged with intense lighting. The Lebus soldiers who were facing the group of clod dolls weren’t able to stay as calm as their master. The small old women had suddenly transformed into an atrocious monster like one coming out from an old tale. When they shifted their gazes, the faceless dolls silently approached. It looked as like they were rolled up in the world of an ugly fairy tale. If there were those who doubted their own eyes and stood petrified, there were also those who fell off their horses because of too much surprise. They were even soldiers who fainted on horseback after having shouted “monster”. Those stirred up by instinctive fear threw away their weapons, turned the necks of their horses and swiftly rode their horses trying to escape from the demon by even a little. There, the clod dolls attacked like a cluster. Lim and Mashas allowed the approach of the dolls while in confusion and had no choice but to wield their sword. The sword which Lim wielded sent the head of the nearest doll flying. Mashas’ sword also cut the arm of another doll. Judging from the sensation transmitted through the sword, the dolls were slightly harder than clay. Fixing her breathing, Lim held a faint hope inwardly. However, that hope was immediately swallowed by a new shock. Even after losing the head or an arm, the dolls’ movements did not decline at all. They stretched their remaining hand, or dragged their body trying to collide it with them (Lim and Mashas and company). One Lebus soldier was caught by the dolls and dragged down to the ground. The dolls swarmed around that soldier who fell on his back. The scream which was raised stopped halfway. The dolls thrust their hands or fingers and from the gaps of the armor tore apart the soldier’s body. The soldier whose face was smashed by stone-like hands, with his eyes and nose crushed and his mouth torn died. Arms and legs were also scooped out from his body and white bones in the flesh dyed dark red peeped out. This ghastly scene was unfolding everywhere. Among the Lebus soldiers, there were also those who held their ground and wielded their sword. But, before an opponent that was too different from convention, they couldn’t display their usual power and were gradually overwhelmed. Lim and Mashas tended to retreat several times, but there were so many dolls that they couldn’t move as they wanted. Lim and Mashas swung their swords to the dolls that approach. A doll, whose waist was bisected, divided into the upper and lower part of the body fell. But, the lower part immediately stood up and came to collide with them. Similarly, the upper part advanced as it crawled on the ground and tried to catch the horse’s legs. Out of breath, Mashas grumbled. How should they fight an enemy who approached without fearing swords and did not stop their movements even after losing their head or an arm? Lim clenched her teeth and looked at Urz, Elizavetta, and the strange monster which was on the other side of the swarm of dolls. Compared to that monster, these clod dolls shouldn’t be that big a deal. They (Elizavetta and Urz) should need help much more than them. However, the reality was that Lim didn’t have even the power to mow down these dolls. Mashas said. The old Earl’s grey hair and beard were heavily moist with sweat and some parts of his sword were chipped. That was no surprise; he had continued cutting the dolls. To Masha’s proposal, Lim unusually got angry. Her golden hair was also disheveled and the forelocks stuck to her forehead. Even while they exchanged words, the clod dolls crowded round. Though Lim eagerly swung her sword, the sword blade finally broke and flew. It was already too late to escape. At that time, Lim even thought that she heard an auditory hallucination. It was that sudden. When she turned around with a surprised expression, silver hair fluttering in the wind jumped into her view. Ruby-colored pupils retaining fighting spirit were turned to the clod dolls. On the hand was a long sword with a silver blade. The blade was clad in an invisible wind. Passing through between Lim and Mashas, she stepped forward. She swung the long sword straight down. The wind released from the long sword jumped in between the dolls while raging like a beast. The whirlwind pulverized dozens of dolls in an instant. Setting up the long sword again, the girl scrutinized the scene. Lim finally uttered her voice. It was the Vanadis of LeitMeritz, the “Wind Princess of the Silver Flash” Eleonora Viltaria. It was fortunate for Elen that this place, where Urz and company were, was southeast of Lebus. This was because it was a distance of about two days nearer than Lebus’ castle town. Furthermore, it also saved her some trouble since Elizavetta was there. Arifal sensed Valitsaif’s presence and told Elen. The silver-haired Vanadis wielded her long sword and cut the swarm of clod dolls one after another. Lim and Mashas looked at that scene with eyes wide opened. When the clod dolls were cut by Arifal’s blade, they crumbled onto the ground and stop moving again. Without stopping her hand wielding the long sword, Elen glared at Baba Yaga who was far away. It was definitely not a beast. It was also different from a dragon. It was a monster which kneaded ill will. Elen’s voice got dry with a shudder enough to make her understand this fact. Her hands which held the reins damply got wet with sweat. If she was not conscious of it, her breathing would become confused with strain. She had heard about the existence of demons from Sasha and Sofy. But, hearing and seeing are two different things after all. This was the first time that Elen had ever seen a demon. If she believed the story of Sasha and Sofy, only a Vanadis could confront such a monster. Lim and Mashas who finally fixed their breathing answered respectively. As Elen nodded with a smile, she rode her horse. She made her horse jump into the middle of the dolls. She swept to the right and mowed down to the left. Each time Arifal drew a silver trail in the space, a whirlwind arose. Cutting down all the swarms of dolls which approached her, Elen resolutely charged into the midst of the enemy. Baba Yaga, seeming to have focused her consciousness to Urz and Elizavetta, didn’t do anything to her who was approaching. The silver-haired Vanadis passed through the swarm of dolls. At that moment, a black shadow jumped out from the side and rushed onto Elen. The silver-haired Vanadis reflexively wielded her long sword. A hard sound also similar to the clash of a metal and a rock resounded. The black shadow greatly leapt back and took distance from Elen. Elen also pulled the reins, stopped her horse and glared at that shadow. It was a young man. He had twined a green cloth around his black short hair and wore thick clothes which treated fur to the collar and sleeves. Elen knitted her brows. The Silver Flash in her hand was not an ordinary sword. It was a Viralt which could cut and tore even the scales of a dragon, much less thick armor and helmet. It should be difficult even to catch it. If a human were to do such a thing, his hand would obviously be blown off. But if the opponent wasn’t human, then it was a different story. Arifal grasped by Elen briskly emitted a warning. And above all, this man had an eeriness which was very similar to Baba Yaga’s coiled around him. The man called Elen like so. The silver-haired Vanadis’ expression became more and more severe. Elen did not know, but this man was Vodyanoy. Elen set up her long sword and turned around to Vodyanoy. The strange atmosphere of something inhuman emitted by Vodyanoy made Elen become cautious. Elen got off her horse. Leaving the case that he was not human aside, she realized that with an opponent who was not so, it would be rather disadvantageous to be on horseback. Vodyanoy who saw that squinted. When he finished speaking, Vodyanoy kicked the ground. The distance to Elen should be about ten steps, and yet he shortened it in an instant. Although Elen was surprised at his movement, she didn’t get confused. She wielded the Silver Flash while falling back. A sound similar to a blade sound reverberated and Vodyanoy’s right hand vigorously jumped up. At the same time, Elen’s long sword was also flipped. Vodyanoy greatly opened his mouth and stuck out his tongue; his tongue stretched. The dark red tongue approached Elen straight like a spear. The silver-haired Vanadis opened her eyes wide, promptly twisted her body and dodged it. But, Vodyanoy’s tongue suddenly drew an arc and twined around Elen’s right hand. It was a tremendous power, and it tried to draw Elen towards Vodyanoy. Elen did not resist its power. She instead went with the flow as she lightly kicked the floor, and shortened the distance to Vodyanoy at a stretch. Stretching out her left hand meanwhile transferring Arifal which was in her right hand to her left hand, she twisted her body. A swing. The long sword glittered and cut the dark red tongue faster than Vodyanoy who noticed Elen’s movement could retract it. As expected, even the demon held his mouth and bent backward. Without pause, Elen kicked the ground. While shortening the distance to Vodyanoy, she grasped the Silver Flash with both hands. Moreover, Arifal accelerated her movement with the power of wind. With a driving cry of drive, Elen struck with her long sword. Vodyanoy vigorously raised his right foot against it. A strong shock blew off Elen and Vodyanoy respectively. Elen wore wind on her body with the power of the Silver Flash and got away from the enemy without breaking her posture. On the other hand, although Vodyanoy greatly broke his posture, he also took distance from Elen while jumping on the ground with only his left foot. Vodyanoy lifted his right foot and fixedly stared at it. The shoe which Vodyanoy wore was torn up by the crash just now and the shoe sole completely tore off. On the other hand, Elen did not care about that. It looked like she would become crazy if she faced this man any further. Even though not that much time had passed yet since they began to fight, several lines of sweat streamed down Elen’s face. Her breathing was also beginning to be confused. Be it when she was in a mercenary group or after she became a Vanadis, Elen had traveled to many battlefields. However, she had never encountered such a monster. Vodyanoy, not answering Elen’s question, mumblingly moved the inside of his mouth, but he soon greatly opened his mouth and stuck out his tongue. The tongue which Elen should have cut off had completely regenerated. While stroking his tongue with his fingertip, Vodyanoy contentedly nodded. Elen once again felt a shiver. Spreading her wings, Baba Yaga flew into the air. The demon raised both her hands. Crimson flames were created between them, swelled up in a flash and became a fireball. Elizavetta swung the Thunder Swirl to it, which approached while devouring the atmosphere. The fireball was blown off into pieces and sparks poured down on Elizavetta. Urz picked up arrows and shot them, but Baba Yaga didn’t even try to avoid them. They bounced on the demon’s skin and fell to the ground. In both of Baba Yaga’s hands, lightning shining white was created this time. In response to Elizavetta’s shout, the black whip changed its shape to that of a sword. The red-haired Vanadis repelled the shot lightning with Valitsaif. Particles of white light scattered into the atmosphere. Without pause, Baba Yaga nose dove and attacked Elizavetta. The demon’s claws and the lightning sword clashed, and the jet black old witch flew to the sky using the shock provoked by that clash. Elizavetta quickly turned her body around and turned towards the demon. It seemed that the equal clash left only a shock to the hand of both parties. As Baba Yaga flew in the sky, she released a fireball and thunderbolt and attacked under the cover of flames and light. And after having given a blow, she escaped again into the sky. It was the repeated of this over and over. Urz could only watch Elizavetta’s and Baba Yaga’s fight with a hopeless expression. When he surveyed the surroundings, Elen was fighting Vodyanoy in a distant place, Lim and Mashas and a small number of Lebus soldiers were still fighting the clod dolls. Although everyone fought hard and they fell into numerical inferiority, they were still fighting strenuously. Urz grasped his bow desperately and prayed. That he wanted power like the time when he fought against the Double Headed Dragon underground in a run-down shrine. The current him would become just a hindrance to Elizavetta. There were few arrows, so even if he shot them, they would probably not even inflict a scratch. Elizavetta said while wielding the Thunder Swirl. Her body was black smeared with soot, her red hair was disheveled and her dress was slightly and there was nothing left of what it used to look like. Within it, only her golden pupil and her blue pupil were shining tinged with vitality. To Urz who was about to refute, the red-haired Vanadis curtly declared. Her feelings which the Rainbow Eyes revealed in the depths of her pupils cleared away Urz’s hesitation. Even if he was here, he would only get in Elizavetta’s way. He must hurry to Lim, Mashas and the others. Her back turned on him, Elizavetta called out to the youth. Urz began to run. Baba Yaga who saw that released a fireball at Elizavetta; meanwhile, she nose dive while drawing an arc in the sky. It was at that time that Elizavetta stretched out her body on the ground while vigorously twisting it. While lying down, she wielded the Thunder Swirl. A roaring sound shook the sky. A dazzling flash was emitted from the tip of the black whip and it filled the surroundings with a white light. Taken by surprise, Baba Yaga’s eyes were burnt. Elizavetta continued a swing tossed about for this instant. It wouldn’t have been possible if the demon wasn’t focusing on Urz though. Elizavetta got up immediately. She was able to avoid a direct hit of the fireball having stretched out her body on the ground. Since Urz had his back turned on them, he did not receive the Veda’s effect. The red-haired Vanadis shortened the distance from Baba Yaga and swung the black whip. The thunder stroke which Valitsaif wore swelled up and countless electric discharges arose. The whip which was tinged with a white shine and undulated in the space was divided in nine parts from the tip of the handle; each part clad in lighting harked back to a dragon raging. The released thunder burned Baba Yaga’s left arm, passed through as such and attacked the clod dolls from behind. The shock wave contained in the thunder stroke pulverized the dolls altogether. As a result, it opened a narrow path to Lim and company. It was the path which Elizavetta had created for Urz. Near it, Elen was fighting with Vodyanoy. While feeling the aftermath of the Veda on his skin, Urz eagerly ran. As she annoyingly spitted out, Baba Yaga mowed down her burnt left arm. Elizavetta who was exhausted from using Vedas in succession, was unable to avoid it, and was thrust away. As she got down on a knee without being concern any more than that with the red-haired Vanadis, the jet black old witch chanted an incantation. At that moment, overhead of Baba Yaga ── darkness was born in the empty space. It swelled up in a time even shorter than an instant and became a jet black snake as big as a pillar of a huge castle. That darkness was the miasma created by Baba Yaga. The huge snake-shaped black darkness wiggled its body and approached Urz from behind. It rushed on with an uncanny stillness emitting neither sound nor voice. In its mouth which was greatly opened up, thick sharp fangs of darkness were lined up. At that time, silver hair jumped into Urz’s field of vision. It was Ellen. When the silver-haired Vanadis had flipped off from Vodyanoy, she turned around in the sky using that momentum and jumped. She ran to Urz and got down behind the youth. She took a small breath. Her red eyes glared at the jaw of the snake which approached Urz. The Silver Flash’s blade sucked up the atmosphere, wound it on and built up a big hatchet of ferocious windstorm. The stormy vortex released from the silver blade became a huge invisible blade that attacked the big dark snake. The shock wave scooped out the earth and the wind screamed and raged. Elen stared wide-eyed. The big snake formed by the miasma was certainly blown off with one blow of the Veda, but as it soundlessly flickered, it regained its original form in an instant. It was not only Elen who was caught in a bout of surprise. It was the same for Urz who was watching her actions from directly behind her. And, the youth noticed that Elen stood bolt upright. A slight stiffness in the instant immediately after having released her Veda. Urz didn’t know what would have been known if he was Tigrevurmud Vorn. The dark big snake which had completely regenerated its head was going to devour her. Urz hugged Elen from behind and fell down with her on the ground as such. The big dark snake passed above the two people’s bodies. However, Urz’s act only delayed the result brought about by Elen’s moment of stillness just a little. As the big dark snake once again wriggled its tall figure in the air, it attacked Urz and Elen who finally got up from right above. In the sky, Baba Yaga revealed a distorted smile. Both Urz and Elen had a knee on the ground, and would probably not be able to escape from the big snake no matter how they move. The youth cursed his own carelessness. Suddenly, Elen stretched out her hand from the side and embraced Urz. She held the youth’s head with her left arm, raised the Silver Flash and tried to use a Veda. Faster than that, the snake of darkness swallowed the two of them as it devoured the ground along as well. Elizavetta’s sorrowful cry echoed in the dark indigo sky. When he regained consciousness, Urz felt a faint suffocation and at the same time a strange sensation. His field of vision was wrapped in darkness. Something soft was pressed on his face, but strangely he did not feel any discomfort. Urz moved his right arm and touched it. There was warmth and it was roundish. It was so soft that his fingers sunk and it had elasticity to the extent of pushing back his fingers while they were on it. He heard a scolding-like girl’s voice immediately next to him. Urz’s body stiffened out of surprise. His hand was caught by something and slowly torn off. A little shyness was included in her amazed voice. Urz finally understood what the thing which was pressed on his face was and in what kind of situation he was now in. Elen’s reply to Urz’s mutter was slightly late and somewhat lonely. In the darkness, Urz was hugged by Elen. What was pressed on the youth’s face was the swelling of her rich chest. Urz tried to swiftly separate from her, but Elen held the youth’s head with her left hand not letting him. To the silver-haired Vanadis’ words which were to admonish him, Urz pulled himself together. The youth finally remembered what happened just before he lost consciousness. If so, then it meant that this was inside the big snake’s stomach. Urz softly held her waist and looked around. However, nothing except darkness was reflected in the youth’s view. There was no light at all here. It was to the extent that it had an optical illusion that perhaps he had not opened his eyes yet. The air filling in the darkness was lukewarm and unpleasant. Urz also got flustered to the fact that there was nothing to touch other than Elen. Even if he desperately stretched out his legs and hands and moved, far from touching a wall or the ground, they didn’t get entangled on anything. He didn’t even know whether he was floating or sinking. Elen who noticed Urz stirring said as to calm him. The youth couldn’t see it, but the Silver Flash was grasped in Elen’s right hand. She created wind and made it check on how their surroundings were. Looking up at Elen who seemed to be thinking, Urz unintentionally spoke of words which sounded more like blame. At that time, Elen had protected Urz. In that situation where she protected the youth, she tried to use her Veda. For that reason, her action was late and the two of them were swallowed by the big snake. If she had abandoned Urz, she would have definitely made it in time. Elen did not answer immediately. She put strength to the left arm holding Urz’s head. Though the youth who found himself being pressed more on her rich swellings felt tense, even so he looked up at the silver-haired Vanadis with a serious expression without being flustered any more than necessary. Though Elen calmly said so, it was a tone as if answering not to Urz, but to somebody else. A breeze shook and suddenly passed on Urz’s cheeks. Arifal was comforting its master. Staring at Elen who should be in the darkness, Urz was not able to utter any words. This was because to her words now, he could sense her strong feelings in the throbbing transmitted to her left hand, which hugged him, from her chest. Elen calmly continued her words. Urz gritted his teeth and strongly clenched his fist. His nails cut into his palm and blood blotted. Even so, he wasn’t able to repress the feelings which suddenly welled up. — What am I doing…?! Anger the likes of which he had never felt before wrapped the youth. Elen was thinking in this way. And yet, he, who could not remember yet, was here. He, who was Tigrevurmud Vorn. 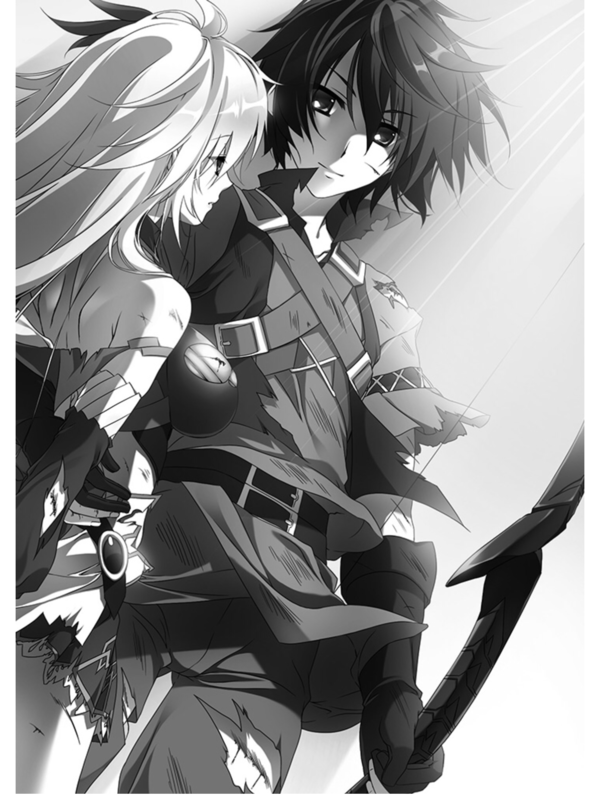 Even though Elen protected him knowing full well that she might lost her life. The one she helped was Urz. The youth’s anger was probably transmitted through her body which was in contact with his. Elen lightly tapped Urz’s shoulders and said in a bright tone. The silver-haired Vanadis interrupted her words midway. A small groan which revealed pain leaked from her lips. Urz stared wide-eyed in surprise, but he immediately understood. Darkness turned into small dust (rubbish) and coiled around them. It soundlessly burned Urz’s skin. The pain which Elen received was probably the same, too. What was frightening was that they had no means of resisting at all. The dust of darkness approached then from all directions and all angles, burning anything in the range of about a fingertip from it. Without being able to avoid or prevent it, it was also impossible to escape from it in this space. Feeling pain on the head, face, nape of the neck, shoulders, arms, belly and feet, Urz and Elen writhed. Elen caused created wind with Arifal and scattered the dust, but the dust immediately headed towards them again. It wasn’t even a stopgap measure. He wondered whether his thoughts were optimistic, or it just meant that she just wanted to harm him to a degree where he wouldn’t die. Elen bitterly spitted out. Though she said that, one could guess from her voice that she hadn’t given up yet, but it seemed to be a matter of time. Neither she nor Urz had any means of dealing with it. The darkness overhead the two of them wriggled. Urz and Elen startled looked up there. Despite there being still no light, the two people clearly saw that movement. A huge big snake, which was formed as the dust of darkness gathered, was slowly heading towards them. Elen, not giving up, raised her long sword, but her voice was interrupted halfway. On the arm of the man (Urz), her body suddenly became heavy. She seemed to have lost consciousness. It could be said that it was no wonder. In addition to a fierce battle, the dust of darkness was even now hurting them. As for Urz if he relaxed his guard, it seemed that his consciousness would fade away. So as to not separate from her, Urz strongly hugged the silver-haired Vanadis. The youth did give it his all like Elen, but while thinking about a method to come through this situation, he was seized with a strange sensation. —I wonder what it is… What’s with this situation? He had once been put in a situation very similar to this. He had such a feeling. It was not exactly the same, but by looking at the details, you might say that they were pretty similar. It was an occurrence which made one lose all feelings. It made the youth hold a strong determination of not letting such a thing happen again. —That’s right. I absolutely won’t let such a thing happen…! He should have something in order to not let such a thing happen. In the bottom of his consciousness, something called so. The man nodded without hesitating and reached out his hand to it. But because he was strongly thinking about her. Because he did not want to lose her. There was a marsh in the depths of his consciousness. In that marsh that was deeply stagnating, he plunged his hand in. The man shifted his body to the back and supported Elen with his body. He could maintain at least that posture. It was absolutely necessary in order to free both his arms. Ahead of the man’s gaze, the big dark snake increased its speed. The man pushed straight up his left arm which became free. So as to not let an incident like the one of that time repeat. Heat hovered in the man’s left hand. “Darkness” which was completely different from the darkness surrounding them appeared from within the man’s hand and extended long and slender up and down. A string linked two ends (of the darkness) which were greatly warped. There was a bow made from the “darkness” in man’s left hand. At the same time, countless scenes were revived in the man’s consciousness. Every time one of the faces of the people whom he had met so far floated up, fighting spirit burnt in the man’s black pupils. When the face of a certain old man floated up, the color of sorrow flashed through the man’s pupils. The old man’s name was Bertrand and he had served as the man’s personal attendant for a long time. In the fight in the Sacred Caverns of the Palace (Sangroel), Bertrand protected the man and lost his life. Within the darkness. “Darkness” was born in the man’s right hand. It became an arrow in an instant. When the man nocked the arrow to the bow, wind arose around Arifal which Elen held. The silver-haired Vanadis stared wide-eyed. This was because her Viralt, this long sword moved without her order. The wind formed a current and gathered to the jet black arrow’s sickle. The wind became a whirlpool, turned into a spiral and surrounded the arrow which the man held. The man strongly drew the bow to the limit. He cried towards the snake which approached before their eyes. The shot arrow soundlessly pulverized the big snake. It charged to the upper part of it as is. The man’s target was not the big snake. It was not this darkness, either. It was the demon ahead of it ── Baba Yaga. If it was this “arrow”, it should pass through everything, fly over all and pierce the demon. After a short instant, a scream which couldn’t be regarded as that of an old woman or that of a beast echoed. At the same time, the darkness surrounding the man and Elen collapsed and melted away. They first felt the sensation of the hard ground from their shoe soles. And then they felt the wind blowing on their skins. The sky which held down dusk was spread overhead. Grasping a jet black bow in his left arm and holding Elen who lost consciousness in his right arm, the darkish red-haired youth stood on the desolate earth with a resolute figure. A blurred voice tickled the man’s eardrum. When he moved only his gaze and looked there, Elen who seemed to have regained consciousness narrowed her eyes and looked up at the man. Spreading a smile on his lips, the man answered. The silver-haired Vanadis’ eyes were greatly opened wide and a smile floated on her face. That way of calling her was the proof that the man was with no doubt Tigrevurmud Vorn. Elen once again called the youth’s name; even though many words were overflowing in her mind, only that came out of her mouth. The gray clouds which covered up the sky were interrupted and many lines of the setting sun’s sunlight ran into the ground. While taking the sunset with her back, Elizavetta struck dumb at the circumstances which happened in succession, stood stock still on the spot. When she thought that the big dark snake had swallowed Elen and Urz, the big snake’s head was blown off earlier than before time of about ten counts had passed. It was indeed an instant. A ray of black light which surged from the inside of the big snake pierced the space as such, and shot out Baba Yaga who was in the sky. That light that was released was without a doubt aiming for Baba Yaga. As the jet black old witch staggered in the sky, she soundlessly disappeared just like that time in that run-down shrine. At the same time along with that, the clod dolls which Lim and company were fighting crumbled one after another. Like dolls of sand fanned by the wind. Even the man called Vodyanoy who were fighting against Elen disappeared before she knew it. And when the big dark snake disappeared, standing there were a man and a woman. The two people’s short conversation rode upon the winds and reached the ears of Elizavetta who was standing in a distant place. The red-haired Vanadis realized that it was over. Both the nightmare and the dream went away with dusk. A black lump moved to a snowy field where daylight didn’t shine as it crawled. It was neither a beast nor a human. That monster who walked while painfully breathing was Baba Yaga. She had escaped from the battlefield using all her remaining power. Her left arm was burnt and it became like a dead rotting tree; the horn on her forehead was broken and half of her face was torn off. The wings on her back were also torn up here and there and exposed a horrible appearance. There were wounds all over her body and black blood was endlessly flowing. In a world where one side was white, only traces of the monster walking exposed the ashen ground which was mixed with black stains. Baba Yaga stopped her movements and searched for a presence. It’s fine as long as she knew the location of the “Bow” and the Viralt. Their presence was more than one Belsta away. Like this, they would not chase her. But at the same time, Baba Yaga frowned. She felt the presence of a demon like her. And it was immediately nearby. However, if it was Vodyanoy, it was incomprehensible that he did not show up immediately. Footsteps could be heard. Baba Yaga moved her aching body and looked there. Standing there was a human. At least, in appearance. A small-sized body wrapped in a thick overcoat. Small hands, short feet; a bald head wearing a hat. His eyelids were awfully big and so thin that you don’t know whether or not he had eyes. Those who knew those traits would call him so. Duke Ganelon. But, Baba Yaga called that man by a different name. Koschei. It was the name of someone non-human like Torbalan and Baba Yaga, handed down among people for a long time. Ganelon denied while grinning, and approached the demon showing no signs of fear. Baba Yaga turned her body and tried to escape, but in the next moment, the figure of Ganelon was before the old woman’s eyes. Even though there was a distance of about ten steps between both of them. Ganelon’s small hand gripped the demon’s face. Some anger was included in his words. The face of the old demon woman creaked and a scream leaked (out) from her mouth. From Baba Yaga’s face, black fog-like miasma rose up. Ganelon was absorbing the demon’s life. The demon struggled. But while having a body twice as big as Ganelon’s, Baba Yaga could not move her body as she wanted. Like a pitiful insect which fell prey to a natural enemy, the old demon woman was going to be eaten. Even so, the old woman strenuously raised her right hand and tried to tear up Ganelon’s body. Ganelon extended his free left hand and caught the demon’s right hand. Though it was at a dreadful speed, but it was a natural movement which didn’t let one feel it. A dry sound resounded and the demon raised a short scream. Ganelon had crushed Baba Yaga’s right arm. That was the last reaction that Baba Yaga showed. From Ganelon’s right hand, something like black sand rustlingly spilled over and fell. It was Baba Yaga. The demon who could no longer maintain her body as her life was absorbed quietly crumbled and died out. It was not only her face. The shoulders, arms, feet, wings; Baba Yaga’s crumbling was also extending throughout her body. A demon that tormented humans so much. Who still survived even after receiving a powerful blow and should have probably been a threat for them in the future, was dipping its body into the deep water of death. On the other hand, both eyes of the man who was small and looked weak were filled with overflowing malice. The demon’s right hand lost power and fell to the ground. At that moment, the demon’s shoulder slipped down from its body like a withered branch separated from a tree. It became ash and was buried in the snow. As a time of about 30 counts passed like that, the traces of the demon called Baba Yaga had already disappeared there. There were just black ashes buried in the snow. Ganelon, who contentedly nodded, suddenly feeling someone’s presence, turned his eyes to the trees soaring in a distant place. Silently standing there was an old man who wrapped his body in a black robe. Ganelon knew that that old man was called Drekavac. He was a demon like Baba Yaga and had served Duke Thenardier before. Ganelon was surprised by the fact that Drekavac had showed up, but finding it suspicious that he was just standing there without saying anything, Ganelon frowned. If he had intended to save Baba Yaga, he might have shown anger or regret. Ganelon calmly asked. Drekavac answered indifferently. Ganelon cocked his head in puzzlement. He thought that they were originally people of thin friendship, but they shouldn’t be so composed. At Ganelon’s words, Drekavac revealed a sneer in the inside of his hood. Bloodlust filled Ganelon’s eyes. The Ex-Duke put power into his right hand, slightly leaned forward and took a posture to kick the ground. While saying so, Ganelon however did not move immediately. Drekavac, looking like he was just standing, did not show any openings at all. He did not ride on Ganelon’s provocation either. Drekavac turned his back. The voice of the old demon was in no way loud, but it properly reached Ganelon’s ears. Drekavac walked away as such and disappeared into the trees. Only Ganelon was left on the snowy field. When he undid his stance and took a breather, Ganelon snorted in displeasure. Soliloquizing, Ganelon began to walk in the snowy field calmly. For the time being, his purpose of eating Baba Yaga was achieved. He would settle with it for now. Ganelon slowly walked while leaving black shoe marks on the white ground. The Lebus soldiers were burying their dead comrades near the run-down shrine when the battle was over. Although said burial, it doesn’t mean that they dug holes and then covered them. In this case, they collected helmets and gauntlets and carved the owners’ names. Blended with the soldiers, Elizavetta, Tigre, Elen, Lim and Mashas also helped with the burial. Many gruesome corpses told them that the experience of just a while ago was reality. There were also a lot of soldiers who vomited at that sight. The number of Lebus soldiers did not reach sixty horsemen. Since the number of casualties did not reach twenty, they calculated that about twenty horsemen ran away. It was no wonder if you think about the opponent. A senior soldier proposed that and Elizavetta accepted it. In addition, she also added not to charge them with the crime of running away. Originally, a flight in a battlefield was regarded as a crime. This was because it was a necessary measure in order to keep the morale and also not let the soldiers, who held their grounds and fought, hold dissatisfaction. But, Elizavetta made this time an exception and the soldiers also showed agreement. When the burial was finished, Elizavetta gave words of thanks to the soldiers with her back to the setting sun. The red-haired Vanadis’ figure was awful. Her red hair was disheveled and the hems of her dress were torn in several layers. Her white skin was badly-bruised and slightly dirty with earth and sand. But, a bright smile floated on Elizavetta’s face. The feeling of being proud of her soldiers was spread in her golden pupil, and the feeling of sympathy to them was spread in her blue pupil. That being also transmitted from her voice, the soldiers stuck out their chests to their master whom they looked up to, stretched up their back and saluted. Elizavetta ordered half of the soldiers to rest, and the remaining soldier to search for those who ran away and the other units, and dismissed them for the time being. It was after that that she faced Tigre. Elizavetta and Tigre went to the shade of the run-down shrine to avoid the soldiers’ eyes. Both of them looked straight at each other, their expressions were cloudy and filled with hesitation and impatience. Elen, Lim and Mashas were watching that scene in a slightly distant place. Lim called her lord’s name as to reprove her. Her blue eyes had dim uneasiness. Perhaps he had guessed Lim’s inner thoughts, Mashas lightly tapped her shoulders. Lim unintentionally turned towards the old Earl with the gray beard. Mashas nodded and laughed. But, Mashas knew that Tigre would not choose that path. Ahead of their looks, Tigre was in a maelstrom of confusion. He was about to open his mouth several times, but each time he closed it and rethought the words in his mind. It was also the same for Elizavetta. However, Tigre finally made up my mind and said. Elizavetta opened her eyes wide and stared at Tigre. She then narrowed them dejected. Troubled, Tigre rummaged his darkish red hair. Elizavetta said. As he stopped using honorific language and expressed his thanks, Tigre then answered her words of a while ago. At his words, Elizavetta opened her eyes wide as she was surprised. Then, she lonely muttered. As Elizavetta dropped her gaze and then returned it to Tigre, she let some uneasiness spread in her Rainbow Eyes and asked. She asked about the time when he was called Urz. Tigre answered so and continued. These words of Elizavetta seemed to be somewhat peevish rather than blaming him. After being at a loss for words for an instant, Tigre shook his head. Someday, he would return to Alsace in the Brune Kingdom. There were still two more years by the contract, but no one knows what will happen after an incident of this level. As he thought about it to this extent, the silver-haired Vanadis’ smile floated within Tigre’s mind. Tigre rummaged his darkish red hair. 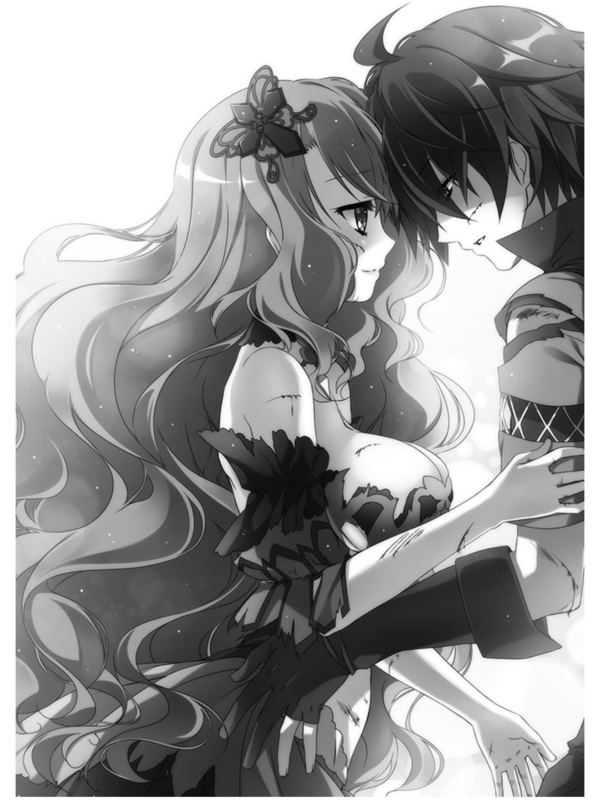 Even though he only said it to Elizavetta just now, he was reluctant about leaving Elen’s side. Driving away his discord aside, Tigre stared at Elizavetta. He would talk with Elen after this. But before that, there was something that he had to say to Elizavetta. Elizavetta asked with a nasty voice. It was when Tigre’s decisive battle with Duke Thenardier was imminent. Elizavetta had cooperated with Tigre who was leading “the Silver Meteor Army”; although Elizavetta had also cooperated with the enemy Duke Thenardier. Elizavetta shrugged her shoulders and sighed. She seemed to really think so. Tigre shook his head. He laughed and said. Elizavetta fixedly stared at the youth this time. Then, she laughed. Elizavetta asked with a provocative gaze. That possibility still existed. It wasn’t as if the ill feelings which were between Elen and Elizavetta had melted. Elen would not forgive Elizavetta and Elizavetta would also not forgive Elen. After thinking a little, Tigre opened his mouth. Elizavetta folded her arms and looked up at Tigre. Tigre tilted his head to the side. Elizavetta did not even try to deny his words. Tigre swallowed his words there. This was because Elizavetta looked up at him with an unusually serious expression. Tigre, overawed by her intensity (appeal), silently nodded. Then, Elizavetta unfolded her folded arms and hugged Tigre. To that unexpected action, Tigre was suddenly at a loss for words and he couldn’t react, either. While burying her face in the youth’s chest, Elizavetta said as she muttered. Tigre did not answer. He just quietly extended his hands to her back and gently hugged her. How long did the two of them stay in that way? It was without a doubt shorter than thirty seconds. Elizavetta released her embrace and quietly separated from Tigre. Tigre likewise separated from her. Elizavetta took her eyes off Tigre and turned to Elen. At that time, Elen was standing bolt upright because of too much shock, but he came to her senses as she received the red-haired Vanadis’ gaze. When Elizavetta gave a small laugh, she took Tigre’s hand and began to walk. Tigre turned a dubious face to her, but Elizavetta kept walking without saying anything. Elizavetta stopped in front of Elen. She released Tigre’s hand and folded her arms and proudly glared at Elen. As for Elen, without so much as hiding her anger, she also glared at Elizavetta. Elizavetta said in a high-handed tone. Elen took the opportunity to blame Elizavetta. But, Elizavetta calmly answered. Not only Elen, but also Tigre and Lim were dumbfounded at this answer. It was only Mashas who was in admiration. Elizavetta stated in a steady tone these words which she had probably thought up beforehand. Her lines also had a “let’s put it as such” suggestion. Elizavetta did not deny Urz. Urz whom she had picked up had just secretly disappeared after the fight with the demon. And at the same time, Elizavetta found Tigrevurmud Vorn said to be missing, and sheltered him. Eleonora Viltaria heard about this and took Tigre back with her adjutant Limalisha, and Mashas and Titta of Brune. It was probably the only method where nobody would be hurt. At that time, the long sword hung on Elen’s waist and the black whip hung on Elizavetta’s waist emitted light almost simultaneously. The two Vanadis surprised looked at their Viralt. As she read the will that her Viralt vaguely conveyed, Elizavetta stared wide-eyed; Elen as well. And Elizavetta’s right arm suddenly hung down languidly. To Tigre who couldn’t hide his strain and impatience, Elizavetta, although tilting her head to the side, tried to lift her right arm. But, it couldn’t stay lifted. Even though she had folded her arms until just now, it stayed just hung down languidly as if it lost strength. Elen asked cautiously. Elizavetta not answering pinched her right arm with her left arm. Then, the red-haired Vanadis sighed. The curse was without a doubt lifted. The demon had died after all. However, she vaguely realized that it would probably require considerable time and efforts until she became able to use this right arm like before again. Coming out of the run-down shrine’s shadow, Elen greatly stretched herself while bathing in the setting sun’s sunlight. She took a small breath as if she was missing the hardships so far. Afterwards, they would return to Lebus’ castle town, welcome Titta, complete the etiquette in form and just return to LeitMeritz. Lim’s calm gaze was turned towards Tigre and the bow in his hand. The reason why the demon was so persistent to Tigre remained still a mystery. It was also unknown how many demons there were. Unless they reached a conclusion in the matter about the demons, Tigre would not have peaceful days. The same thing could be said for LeitMeritz which was entrusted with the youth as a guest General. And also for Alsace which was the youth’s hometown, and the Brune Kingdom itself. The silver-haired Vanadis lightly tapped the shoulder of her adjutant with a pensive expression. By those guys, she meant the other Vanadis ── Ludmila, Elizavetta, Olga, and Valentina beside themselves (Elen and Sofy). Ludmila whose mother and grandmother were Vanadis might have learned something from her family. There was also the possibility that Olga who had fought against Torbalan and returned to her territory Brest was investigating. Elizavetta would probably investigate in detail from now on. She had almost never talked with Valentina, but even if she knew nothing, it would be necessary to talk to her about it. Tigre apologized to Elen with a dejected expression. About the black bow, his heirloom, the youth knew nothing aside from what he experienced by himself. There should have been nothing which had records on the heirloom even in his mansion in Alsace. The silver-haired Vanadis lightly blew off the regret and guilt which welled up in Tigre’s heart with a smile. While holding the feeling of being saved by her smile, the youth nodded. Mashas said while stroking his gray beard. After having rested his body in the castle town of Lebus, he planned to go to the Capital Silesia. He intended to have an audience with King Victor as a messenger of the Brune Kingdom and talk about Tigre. Elen asked the old Earl with a lonely face. She understood that it could not be helped even if he did so, so she prepared herself for that; but as expected she could not repress her feelings. Still, Mashas could not also respond with a smile about this matter. It was when Elen answered so with a serious expression. Recognizing something which suddenly moved from far away, Tigre turned his gaze there. From the other side of the wasteland, the silhouette of a horseman was running. He seemed to be a Lebus soldier. When that soldier recognized Elizavetta’s figure, he stopped his horse about 30 Alsins away from her. As he hurriedly went down to the ground, he stepped forward before Elizavetta with staggering steps. Elen tilted her head to one side with a quizzical face. Lim answered her. At Lim’s words, Tigre unintentionally clenched his fist. Titta was in the castle town. She borrowed a room in the Imperial Palace, so she will be safe for the time being, but his heart could not calm down. When that soldier went down on a knee before Elizavetta, he reported while being out of breath. When he shouted up to there, the soldier took out a letter from the bag hung on his waist. He gave it to Elizavetta with both hands. When the red-haired Vanadis received that letter with her left hand, she gave words of gratitude to the soldier. She called another soldier and ordered to give a meal and bed to the soldier and look after his horse. After seeing that, Tigre walked towards Elizavetta. Elen, Lim and Mashas silently followed. When the Flash Princess of the Thunder Swirl noticed him walking her way, she glanced at the letter in her left hand and returned her gaze to the youth. She held out the letter to Tigre. Perhaps because she was conscious of the unduly distant way of calling him, there was a little interval before she called Tigre’s name. When Tigre nodded and took the letter, he carefully broke the seal and opened the contents. More precisely, it was a letter to Urz. Elizavetta revealed a wry smile. Since the soldier earlier found Elizavetta’s figure, he probably thought that he had to report to her above all. Tigre ran his eyes over the letter, but he put on an expression showing that he didn’t know what to say. Elizavetta inclined her head to the side wonderingly. Elen and company who caught up with the youth put on dubious faces. In Naum’s letter, it was written with a concise literary style that Earl Polus Orgelt Kazakov leading 2000 soldiers had invaded from the southeast, that he demanded to hand over Tigrevurmud Vorn, and that hence, he was in a stance which invited a battle. After Urz went out for Elizavetta’s search, the letter was closed (tightened) with the instructions of coming back at once to the Imperial Palace. The feelings of Naum who was concerned about the youth were transmitted from the sentences, and Tigre expressed his gratitude to the knight in his prime from the bottom of his heart. Tigre looked around at the four people and explained the contents of the letter. When they finished listening, Elen and Mashas opened wide their eyes and put on amazed faces. Unlike these two, Lim and Elizavetta were apparently brooding over something with a serious expression. Lim also had many thoughts regarding the red-haired Vanadis. However, she repressed all such feelings in the innermost depths of her head and gave priority to dealing with the situation at hand. Cold contempt was included in the Flash Princess of the Thunder Swirl’s tone. It was only about once or twice that Elizavetta had met Kazakov, but she knew well his temperament. This was because added to the fact that each other’s territories were adjoined, in the case that something happened, there was a high probability that he would think to become enemy and investigate. Of course, Elizavetta also knew that Kazakov disliked her using the Rainbow Eyes as the reason. And, there was also no reason for Elizavetta to hold good will towards Kazakov. Her eyes of different colors filled with doubt and suspicion, Elizavetta shook her head. Kazakov insisted that Urz and Tigre was the very same person, but then that meant he must know about Urz and Tigre in detail. But, Kazakov had never met Tigre, nor should he have so many interactions with Brune. Elen frowned in displeasure. Elizavetta nodded. As he folded the letter, Tigre asked in a careful tone. At Elen’s words, Lim and Mashas showed agreement as they nodded. However, Elizavetta did not nod. She cast her gaze to the ground and was silently brooding over something. Suddenly, her face got filled with strain. There was a faint unrest on Elizavetta’s profile illuminated by the setting sun. The neighboring geography and place’s name emerged in her mind. When she considered their position and Kazakov’s army’s movements as she expected, that possibility was quite high. The number of soldiers who were here now was approximately sixty. According to Naum’s letter, Kazakov was leading 2000 soldiers. If they were found first and attacked, a defeat would be inevitable even if Elizavetta and Elen fought hard. Elizavetta looked back to Tigre. For a moment, her pupils got cloudy and she seemed to want to say something, but she immediately returned to her expression as Vanadis. As he received the red-haired Vanadis’ gaze head on, Tigre asked in a calm tone. Although Elizavetta frowned as she expected the youth’s reaction, she answered honestly. Elizavetta said in a sarcastic way, but it did not get through to the youth. Tigre calmly stared at Elizavetta. His black pupils were straight and did not shake. The red-haired Vanadis turned her gaze and asked Elen and company for help. Elen said so with a sigh. Elizavetta was dumbfounded; she blankly opened her mouth and looked at Mashas and Lim. Lim answered with a resigned voice and Mashas nodded as to persuade himself. Although Tigre showed a face seeming to want to say “oops!” to this, he did not intend to change his decision. To the confused Elizavetta, Elen said as the finishing blow. It was about three days ago that the Polus army of 2000 which Orgelt Kazakov led had carry out the invasion of Lebus. The Polus army was composed of 500 cavalrymen and 1500 infantrymen; all of them wore armor and helmets and wore fur clothes over their armor. The cavalrymen had spears and shields and the infantrymen carried swords, shields, and bows. They did not openly advance through the highway, but passed through the wasteland and entered from the southeast of Lebus. This was because they would stand out too much if they passed through the highway. Not to mention travelers and peddlers, they would immediately be noticed also by the Lebus soldiers protecting the fort along the highway. And then, Elizavetta would probably strengthen the highway with soldiers. In the negotiations for getting back Tigrevurmud Vorn, it should become important on how far the Polus army could approach the castle town. The nearer the Polus army was to the castle town, the bigger the mental pressure, which Elizavetta would suffer from, would be. Therefore, even if they were eventually noticed, they should get closer to the castle town even if it’s just by a little more. That was Kazakov’s aim. And today, the soldier whom he dispatched as a messenger to the castle town of Lebus had returned. Kazakov invited that soldier into the barrack for the supreme commander. After it was only the two of them, the 35-year-old Earl Polus asked. With his gaze, Kazakov urged him to go ahead. He also knew the name of Lazarl. He was a man who has worked in Lebus since the time of the previous Vanadis. The soldier finished his report with a slightly perplexed feeling. When Kazakov nodded with a moody face, he told the soldier to take a break and dismissed him. Now alone in his barrack, Kazakov revealed a sadistic smile. He investigated using someone and was convinced that Urz was Tigre. When his army resumed its march after finishing its rest, Kazakov gathered the commanding officers and told them so. Even though he had shouted “it’s my war” and had advanced not to the highway, but to the wasteland where it was difficult to walk, the soldiers’ morale was high. As expected of the man with influence second only to Ilda in the northern part of Zhcted, Kazakov was by no means mediocre either as a lord or as a commander. He also had the confidence that the soldiers would follow him even in such a battle. In that way, the Polus army of 2000 once again advanced through the wasteland of Lebus. It was in the morning of the next day that a man asked for an audience with Kazakov, naming himself as a messenger of Elizavetta. Kazakov, also taking the opportunity to rest, stopped his army and met that man on horseback. When he received the letter which the messenger respectfully held out, Kazakov broke the seal on the spot. He quickly looked through the letter inside. That was his first impression. That letter, which Elizavetta wrote as she tied a writing brush to her right hand which couldn’t accumulate that much power, resented Kazakov’s unreasonable invasion and requested him to withdraw at once. As for Elizavetta, even if she was asked whether or not Tigre was there by the other party whom she disliked, there would be no reason to answer honestly. Besides, it was not like she did not hide the existence of an honor guest from others. There were many times when Kazakov himself had such interactions as a feudal lord. But, this time he had forgotten about that. His loathsomeness of Elizavetta made him forget. —Necessary measure, huh. Don’t make me laugh. When Kazakov carelessly folded the letter after she finished reading it, he threw it back to the messenger. Kazakov did not believe Elizavetta’s words about sending Tigre to LeitMeritz. In addition, Kazakov believed that by securing Tigre and sending him to the Capital by his own hands, he could respond to the trust of the King and Duke Bydgauche. Waiting for the messenger to leave, Kazakov resumed his army’s march. By advancing about six Belsta to the southeast from the run-down shrine where Tigre and company had fought against Baba Yaga, there was a lake. That lake which was called the Birche Lake had a distorted, elliptical shape and was half frozen. Because it was dangerous as there were frozen and unfrozen parts, fishermen who lived in the neighborhood had pulled up their ships during the winter. Tigre and the others were at Birche’s shore. There was Tigre, Elen, Lim, Mashas, Elizavetta and 170 Lebus cavalrymen. With the lake to their right and the forest which piled up snow at their back, they were laying a camp out. Even though they would fight an enemy ten times superior in number, the Lebus soldiers’ morale was high. More precisely, after they knew that the opponent was Earl Polus’ army, their fighting spirit uplifted at a stretch. Elen who observed the Lebus soldiers’ state said so and laughed. Tigre and Elen were behind the soldiers. The two people were spending a little time together before the battle begins. The sun passed it zenith and inclined to the west. By the reconnaissance unit’s report, Kazakov’s army seemed to have stopped in the nearby vicinity. The other party, also noticing Tigre and company’s existence, let his soldiers rest and reformed their ranks before stepping onto the shore of Birche Lake. While watching the soldiers who held their weapons and lined up, Elen said with nostalgia. It was approximately one year ago that Tigre was on a battlefield with Elen. It was in the Brune Kingdom’s civil war. When they fought against Ilda Krutis one month ago, he was not Tigre, but Urz; and the youth was with Elizavetta. As Tigre realized that at this time, Elen shrugged her shoulders and laughed. As Elen had said just now, the two of them would act separately from now on. Since this side’s numbers was overwhelmingly few, it could not be helped. The sound of a horn echoed at Birche Lake’s shore. Kazakov army showed up. The silver-haired Vanadis lightly tapped Tigre’s shoulder. At Tigre’s words, Elen responded by flappingly waving her hand. Only these words were enough for now. Parting from Tigre, Elen calmly advanced her horse. She found Elizavetta’s figure and rode her horse there. The red-haired Vanadis also noticing Elen looked into her direction. At Elen’s question (said) in a casual tone, Elizavetta also answered while looking puzzled. Elen said in an unusually strong tone. The ruby-colored pupils and Rainbow Eyes collided in the air. Although Elizavetta returned so in a defiant tone, she understood Elen’s real intention. LeitMeritz was far from Polus which Kazakov ruled. Even if Kazakov’s bereaved family were to think about revenge, it would be difficult to execute it. Elizavetta unintentionally asked. There should be no reason for Elen to do something like that for her. Rather, the fact that Elizavetta’s enemies increased should be convenient for Elen. Elizavetta didn’t know how much of her words were serious. Or was it just a makeshift thought and the first short lines might be her true intentions. The opposite could also be considered. As she hesitated about how she should answer back and remained silent, Elen piled up more words. And Elen’s figure slipped into the soldiers and disappeared in a moment. Elizavetta was fixedly staring at the area where she disappeared. When he knew that the number of the enemies they would confront was only a little less than 200, Kazakov gave a sigh mixed with amazement. And hearing that the Vanadis Elizavetta Fomina was among them, he was further amazed. He muttered so seriously. But, Kazakov braced himself as he recovered from surprise. The opponent was a Vanadis who could be a match for a thousand (men). He should err on the side of caution. Kazakov divided his 2000 soldiers into three units. The first unit was composed of 100 cavalry and 400 infantry and the second unit was composed of only 400 cavalry. And the 1100 soldiers gathered in the third unit were only infantry. This third unit had the duty of protecting the rear of the first unit and was also valuable reserve military power. Making the second unit the main force, Kazakov stood at its vanguard. He wore armor and grasped a mace in his hand. With Birche Lake’s shore to their left, the second unit and the third unit lined up. The third unit stood at their rears. It was a battle formation with the thickness lengthwise. There was no way they would lose if they clashed head on. Kazakov called his adjutant and asked. Kazakov thought about whether there were soldiers who fled. If the enemy’s number was large, he would consider that there was a possibility of a detached force; but he thought that it wouldn’t be that big a deal even if about 60 or 70 soldiers started something. The adjutant looked up at the sky and listlessly muttered. The day had fairly gone down. In another half a koku, the sun would turn gold and the sky would be dyed vermilion. In other words, the enemies who ran away under cover of the darkness of dusk might appear. Kazakov understood that here was enemy territory and that it would become disadvantageous to them when it became dark. While looking at the Birche’s lakeshore that was on the left, the Polus army started their advance. Since the Lebus army wasn’t going to move from the state where they had the forest at their back, the Polus army had to shorten the distance to them. In the place where the distance between both armies shortened to about 2 Belsta, Kazakov gave instructions to the second unit. The second unit began to move in an unexpected way with the enemy close at hand. As expected of a unit composed of only cavalry, their movements were fast. The roar of horses’ hooves which resounded as they were transmitted through the earth seemed reliable for Kazakov. It was his idea to do a pincer attack from the front and rear by having the first unit challenge the enemy to a decisive battle head on, and coupled with that, the second unit which went through the forest, will attack the enemy from the rear. Even if the Lebus army had thought about any moves which would be bad for them (Polus army), there was still the third unit on standby. Kazakov revealed a triumphant smile and grasped his mace. The forest which the Lebus army had at their back was broad and of the size of about 100 Alsins square. The Kazakov troops’ second unit which rode their horses and arrived near that forest immediately got down from their horses. Riding horses wasn’t suitable within the forest where trees grew thick. The second unit’s commanding officer first made 50 soldiers advance into the forest. The soldiers setting up their spears and shields stepped in. What they were cautious about when they advanced into the forest were traps set underfoot. If there was something as simple as just setting rope between trees, there were also cases when steel traps were hidden for pitfalls and hunting. Snow especially piled up in this forest and such traps were hard to notice. The commanding officer encouraged the soldiers as he said so. With only the military power of the first unit, which was originally the main unit, they could overwhelm the Lebus army. They did not need to get impatient. In that way, it was when they advanced about 30 Alsins. The soldiers who were in the forest heard the sound of wind howling. When they turned their gazes to each other wonderingly, one soldier emitted a short scream and fell to the ground. One arrow ran into his head. It was an instant death. Strain ran among the soldiers. It was shot from somewhere. They held up their shields, lowered their bodies and ran their eyes around their surroundings. But, no Lebus soldiers’ figures could be seen at all. They once again heard the sound of the wind. Another soldier’s head was pierced by an arrow. He never got up again. Impatience and unrest were born among the soldiers and they stopped moving with their shields still held up as such. They gathered little by little, huddled together with each other and concentrated their gazes at their surroundings. In the place where about five soldiers had gathered, the third arrow was shot. It went past the side of a shield as if it was carefully aiming at it and ran into the face of a certain soldier. As they watched that man who lost power in his whole body lean on a comrade, the soldiers screamed. They should be able to guess from which direction the arrows came flying from the angle of the arrow which ran into their comrade. But, no matter how much they strained their eyes, they weren’t able to catch the enemy’s figure. Either their enemies concealed themselves very skillfully or they shot the arrows from a fairly distant place. The soldiers, unable to endure it, came out of the forest and reported the circumstances to the commanding officer. Though they had not yet advanced through half the forest, they had already lost three of their comrades. Still, if the enemy’s figure could be found, they wouldn’t have minded advancing; but it couldn’t be found at all. A superstition-like fear made them retreat. The captain who heard the soldiers’ report was amazed as expected, and got angry and harshly scolded them. Even if it was someone who could fire an arrow from more than 200 Alsins away, it was often said that he couldn’t fire it from more than 30 Alsins in the forest. This was because it would definitely hit a tree on the way. Even if he found a little gap so that it did not hit a tree, he would need the skill to shoot the arrow in that gap this time. The captain first had those soldiers step back, glared at the forest and groaned. Impatience arose in his heart. Even though they must quickly break through such a forest and appear from behind the enemy. After thinking, the captain prepared 150 soldiers. He should just completely cover the inside of the forest with soldiers and make them advance. Even if there were casualties, he sent them in by ordering them to just advance as such. As expected, arrows came flying, but the Polus soldiers ignored their hit comrades and silently advanced within the forest. Then at last, one soldier went through the forest. The sound of weapons, angry voices and screams peculiar to a battlefield could be heard from far away. But, that soldier couldn’t even witness the scene of the battlefield. The moment he came out of the forest, his head was smashed along with his helmet by a black whip which tore the atmosphere and attacked him. Standing immediately near the forest was the Flash Princess of the Thunder Swirl Elizavetta Fomina. She still hung her right arm from her shoulder with a cloth, but she grasped the black whip with her left hand and was proudly scowling deep into the forest. The Polus soldiers who were going to pass through the forest at any time now were shocked when they saw her. The enemy’s supreme commander was right before their eyes; without having even one soldier as a guard. Raising a battle cry, the Polus soldiers headed towards Elizavetta. But, their actions were very chaotic. The topography inside the forest did not allow for well-organized actions. And even if Elizavetta was wielding her Viralt with her left hand, she could deal with two or three soldiers all at once. Each time the black whip tinged with lightning tore the atmosphere, a Polus soldier’s body was smashed and blown off somewhere, and fresh blood scattered on the snow. Because of only one Vanadis, they could no longer come out of the forest. If they avoided Elizavetta and made a great detour in the forest, they would further stray from their comrades. Moreover, arrows occasionally came flying and certainly took their lives. The Polus soldiers stopped their movements and gradually began to retreat. —I knew from seeing it many times, but he’s quite something. Elizavetta looked up at the trees and inwardly muttered. Tigre should be somewhere in this forest. He camouflaged his figure by putting on an overcoat with bark stuck on it, and lay hidden with only a bow and arrows. The reason why the Lebus army had the forest at their back was to use the forest and forcibly separate the soldiers in the Polus army. They believed that if it was Tigre, he could hold them back and gain the necessary time. And, Elizavetta would crush and disperse the enemy who came out of the forest. Elizavetta took her eyes off from the forest and turned to look back. Ahead of the Vanadis of Rainbow Eyes’ gaze, the Polus army’s first unit and about one hundred Lebus cavalrymen led by Elen were clashing. Kazakov stood at the vanguard of the Polus soldiers and wielded his mace. He had already defeated nearly ten Lebus soldiers and the mace in his hand was dyed red with fresh blood as if showing Kazakov’s nickname. Within the whirlpool of roars and screams, Kazakov could hide his unexpected thought. While having a military power more than ten times the enemy’s, it was unbelievable why they could not overwhelm the enemy. As he even thought about whether he was so incompetent, he then persuaded himself “that can’t be it”. —Should I throw in the third unit to overcome them at once? When he thought about such a thing, one soldier showed up to report. Kazakov opened his eyes wide. The third unit was in a place where it was hard to receive a surprise attack. After all, the first unit led by Kazakov was in front of them and there was Birche Lake on their left. —Did they put down soldiers for an ambush somewhere? Otherwise, the enemy’s movement will be too fast for sneaking around. The third unit received the enemy’s attack from the rear. Having set the surprise attack were about 30 Lebus soldiers led by Lim and Mashas. They broke the ice of the frozen lake, crossed it and had sneaked around from behind the Polus troops. Hence, they were able to attack with a speed beyond Kazakov’s expectation. It was a raid of only 30 soldiers, so they did not deal great damage. The Lebus’ detached force had immediately escaped on rafts, too. But, the psychological influence that their existence gave to Kazakov and the Polus soldiers was great. Who knows when they would attack again from the lake and the rear? It became difficult for Kazakov to use the third unit as reserve forces. Given the situation, he found it suspicious that the enemy’s total number was less than 200. Originally, the fact itself of standing before 2000 enemies with 200 soldiers was improbable. Kazakov began to wonder about the possibility of a hidden military power. As he decided so, Kazakov resolutely charged into the midst of the enemy. He fiercely flung his mace against the Lebus soldiers that entered his range. He smashed their heads along with their helmets and broke their arms and the swords that tried to block it. Spurts of blood reflected in the setting sun and on Earl Polus’ sublime figure which was on horseback. The mace which he wielded aiming at a new enemy was repelled by a flash of a long sword swung from the side. Kazakov ran his gaze and frowned in surprise as he saw the long sword’s user. It was a young girl with silver hair and ruby-colored pupils. As long as the Rainbow Eyes were not involved, Kazakov was a man who could attend to his opponent with due respect even if that opponent was a Vanadis. Elen sensed that and returned words as a warrior. At the same time with those words, the mace attacked with a terrifying speed. Elen’s body was carried away by the wind pressure just by having grazed it, and the second blow would probably be struck there (where her body was carried). Elen, trying to not clash with it head on, inflicted a wound while shifting the mace’s trajectory using her long sword and looked for a chance. Despite Elen’s sword skills, it would be an impossible feat if not for the Silver Flash, her Viralt. The mace tore the atmosphere and the long sword let wind howl. The sound of blades resounded, sparks scattered and both parties’ weapons clashed over and over again. Suddenly, a metallic sound of destruction echoed drowning out the surrounding voices and sounds. The tip of Kazakov’s mace was blown off from the middle. Kazakov groaned, even so he still swung his mace where only the handle remained. Elen calmly mowed down her long sword. The man’s head flew leaving trails of blood. The Polus soldiers who were around Kazakov opened their mouths befuddled and stopped their movements. As Earl Polus’ head fell on the ground, it bounced once then rolled. Elen approached her horse as if protecting that head and said to the Polus soldiers. When Kazakov’s death was announced, the Polus soldiers lost their fighting spirit all at once and retreated. They were originally told “this is my battle” by Kazakov when they asked about this expedition. The soldiers carried arms and followed for their lord’s sake. Now that that lord has died, they no longer had any reason to fight. There were those among them who advocated for revenge, but there was no one who could unify them. After the Polus army retrieved as many of their comrade’s corpses as they could, they withdrew. After this, it rapidly resulted in the Earl Polus House (who lost Orgelt Kazakov) losing the support of the neighboring lords. It might have been inevitable since they lost Kazakov who was not only blamed by the King for having said “my battle”, but was also a man that had ability. Finally, there was someone who came in contact with the noble feudal lords, who distanced themselves from the Earl Polus House, got their favor and support and quickly expanded his/her influence in the northern part of Zhcted. That person’s name was Valentina Glinka Estes. Thanks, Gonna start reading right away!!. *happy dance* chapters release! Damn, lucky Tigre!….now onto the last. Thanks for your work! Thanks guys!!! Greetings from Brazil!!! Probably somewhere around this. I’m not really sure but hope it helps. thank you for the translation setsuna86! 🙂 btw did tigre got his black bow back or it is just the temporary bow that he used.